On the eleventh day of Christmas, A Gamer Forever Voyaging gave to me... nauts that are psyching? by PaulEMoz in "Grim Fandango", "Psychonauts", "Tim Schafer"
I was going to give away some kind of Pipemania game today, but I couldn't find one that wasn't on an emulator. So instead, I'm just going to give away something excellent! 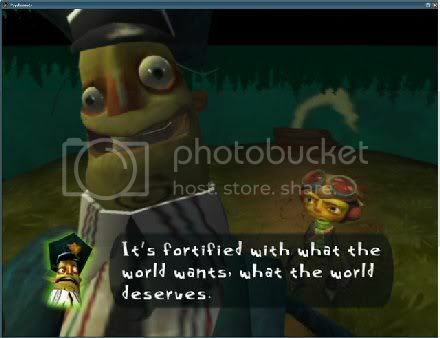 And that excellent game would be... Psychonauts! 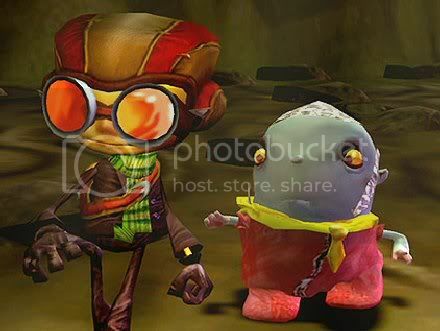 I first played Psychonauts... right when it came out, actually. In fact, I wrote a short review of it for excellent-but-resting-indefinitely games mag, Way of the Rodent. That was when I was living in America, so I've been a fan of this game for a long time. Age hasn't diminished it any, it's still great. It's a platform adventure of the most imaginative kind. 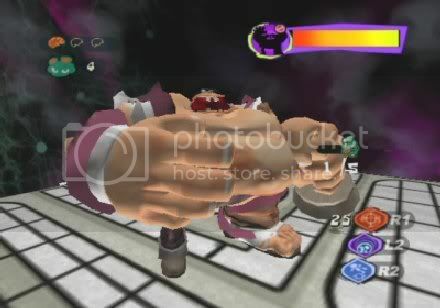 You play Raz, a kid who has run away from his life in the circus (hang on, don't you usually run away to join the circus?) to join a psychic summer camp. Unfortunately for Raz, the camp only allows students that they have recruited, so-called "Psychonauts", so once he's there, the camp leaders phone his parents to come and collect him. Hang on, what? They do, though, realise the Force is strong with this one, and allow him to stay and take part in some of the camp's gentler activities. That's when the game goes around the bend. The actual camp just acts as kind of a hub. The real levels of the game are like nothing else you've played... As a psychic wunderkind, you have the power to enter other peoples' minds! And this, you must and will do. Christ. He'd need a lot of Fairy Liquid. These levels and boss battles are spectacularly imaginative and brilliantly warped, providing an incredible insight into the game's characters... and, I suspect, the designers! You'd probably expect nothing less from the mind behind the likes of Grim Fandango, but it's really quite mental and has to be experienced to be believed. And you can experience it, as I'm giving away a copy on Steam! Here's the scoop: post a link to this write-up somewhere appropriate, then post a comment here telling me what you've done. That'll put you in the draw. Good luck!